Ask my wife what she thought of Michael Bay's Transformers movie, and she'd tell you it was super-awesome five-out-of-five stars mega-excellent fun cool action flick. Ask me, and I'd say it was alright, better than I was expecting but still quite disappointing. Of course, I grew up as a big fan of the 80s cartoon series, and she didn't, which probably makes a huge difference as to our different in opinions on the movie. There is a lot of action. Machine guns, explosions, and of course giant robots. Typical Michael Bay action sequences, all of which were obviously big-budge and contain top-of-the-line special effects. But despite there being giant robots, it all seemed rather ordinary. With giant robots, I would expect to see some new kind of action scenes, something with a new twist, not just a new type of prop. And that's kind of the problem I had with this movie; the giant transforming robots felt like props, not like characters. We are first introduced to the evil Decepticon Transformers when they "infiltrate" a military base and start blowing it all to hell in order to access the computers. They don't get what they're looking for as the computer network is manually shut down, so Frenzy uses stealth (posing as a little boom box) to infiltrate Air Force One and access the network from there. This time the Decepticons are able to get what their after... information about a map, which happens to be imprinted upon a pair of reading glasses that used to belong to an old 19th century explorer named Captain Witwicky. The current owner of the glasses is Captain Witwicky's grandson, Sam Witwicky (played excellently by Shia LaBeouf), who is attempting to sell them on eBay for some cash to purchase his first car. Apparently, the Autobot Bumblebee is already aware of this and is trying to find Sam. Or has already found Sam. Somehow he knows that Sam is going to buy a car, and knows which used car lot he'll be going to as Bumblebee is already there when Sam arrives. Bumblebee is able to ensure that Sam picks him by blowing out the windows of every other car in the lot (though neither Sam nor the dealer knows that it was Bumblebee who did that). How far are we into the movie by this point? Half-hour maybe? And still none of the Transformers have any real personality. Okay, so we move on. At night, Sam hears his car leaving and things someone is stealing it. He chases out to some vacant area where he sees his car transform into a giant robot and send some kind of transmission out into space. Sam flees, and runs into a police car... except that this cop car says "To punish and enslave..." on the side. You can guess what that means. Sam is now being chased by a fake police car (why doesn't he just transform into a robot and pick Sam up? ), when Bumblebee enters the picture and saves him. Soon afterwards, the rest of the Autobots land. As they all introduce themselves to Sam, we finally get to see that these robots actually have some kind of personality. We only get a small glimpse of this throughout the entire movie, and it's only ever shown by the Autobots, but the scenes where it does happen just brings a smile to your face. And if it doesn't, then you must be dead inside. Why is there so few of these scenes? And by few, I mean 2-3 max. And absolutely none for the Decepticons. They barely talk at all, and when they do it's in their native language which sounds kinda like static, so we can't really assertion any emotion out of it. Oh yeah, and I neglected to mention the scenes with the military unit that escaped the attack on the base at the beginning of the movie. That's because they are boring scenes. They're a thread throughout the whole film, but we're never given any reason to care about these military dudes. The characters are basically one-dimensional and I assume were added just so they could have people shooting at the robots. I also didn't mention the scenes with the chick who was brought on board to help decode the Transformers electronic signal. Again, this is because most of her scenes were boring as well. We don't know much about her, and have no reason to care. I also didn't like the idea of the Allspark, which is what all of the Transformers are after. It apparently grants life to anything mechanical that it touches, and turns it into a transformer. I could understand if it could bring to life a complex mechanical brain or something, but any mechanical device? So a vending machine will suddenly and magically gain all the parts and electronics it needs to become a vending machine that transforms into a robot? That just seems completely retarded, especially since they were apparently trying to go with realism in the robot transformations. I know that realism and vehicles that transform into giant robots don't really go together real well, but that was the stated reason for redesigning the Transforming characters from their 80s TV show counterparts. And I fully understand and support that decision. I think it would have been dumb to have a giant Megatron transform into a tiny handgun, or a giant Soundwave transform into a mini boom box. But still, I didn't care for the Robot designs. There was too much metallic grays with not enough color, and all the little intricate moving parts that you could see were quite distracting. Wow, sounds like I really hated this movie, doesn't it? But nah, I didn't hate it. Some of it was really good, such as Sam's storyline. He was a very likable character, much more than Spike from the original series, and the scene of the Autobots out on his lawn was hilarious. Apparently a sequel is already in the works, so hopefully they'll be able to come up with something better now that they've got all the introductions out of the way. Of course, a lot of people were hoping for the same thing with the Tomb Raider sequel, and it turned out to be worse than the first film, so who knows. The Story Sparks - Steven Spielberg discusses his love for the franchise and early concept art for the film. Explores how the writers adapted the cartoon into a live-action movie and why Michael Bay is the perfect director for the film. Human Allies - A look at how the actors were selected and their experiences on the set. Battleground - A piece on the senior officials from the Department of Defense and Air Force who consulted on the film to give it authenticity and the key locations that the U.S. government provided access to. Rise of the Robots - Explores the interaction between Hasbro designers and Michael Bay to bring the toy line roaring to life. AUTOBOTS Roll Out - Michael Bay discusses working with Chevy and its designers and the modifications that were made to the cars seen in the film. DECEPTICONS Strike - The film’s military advisors discuss the “toys” they allowed the production to borrow: F-22 Raptors, Ospreys and A-10 Warthogs. Inside the AllSpark - ILM’s digital artists discuss the challenges of bringing the TRANSFORMERS to life. From Script to Sand: The SKORPONOK Desert Attack - An in-depth look at the making of this particularly epic and challenging scene from initial storyboarding through production and visual effects. Concepts - Early sketch concepts of the robots. Join the fun and show your support for some of your favorite robots with the Suit Yourself website, where you can transform yourself into Optimus Prime, Bumblebee, Megatron, or Blackout just by uploading a photo of yourself. You can then download your photo as a desktop wallpaper, portrait, or IM icon, send it to your friends, or even embed the photo in your website or blog. 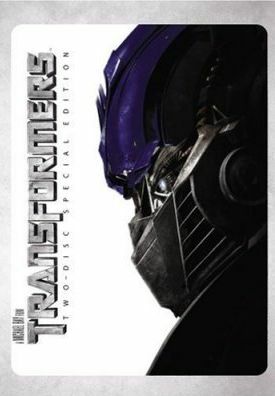 So be sure to check out the site (http://www.transformersmovie.com/suityourself) and join the war yourself as an Autobot or a Decepticon!